Hartley Road, Radford (A Nicholson, 2005). Name. Radford probably derived its name of the "red ford" from the Mottled Bed Sandstone in the high cliff—now largely removed, and which terminated where the Alfreton Road crossed the Leen by a ford, but there was also the Ilkeston Road ford, both of which have been superseded by bridges. Boundaries. The parish of Radford is bounded on the west by Ilkeston Road, but it is impossible not to regard the two large Council Schools, All Souls' Church, the Recreation Ground, Cobden Park, and the Marsh, although nominally in Lenton, practically as being in Radford, which also comprises Aspley, Bobbers Mill, with a crooked line drawn by the Mill-in-the-hole, to Shipstone Street, by or a little north of Gladstone Street to Sherwood Rise, and the boundary, excluding the Forest, runs up Noel Street, Bentinck Road, Peverel Street, and Alfreton Road. 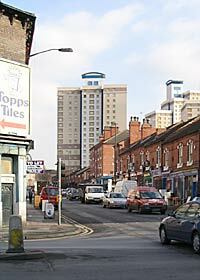 It was annexed to the City of Nottingham in 1877, and the parochial boundaries have become things of the past. Its Geology. Geologically, it is varied and interesting. On the western side the coal measures of what is called the Derbyshire Coalfield come near to the surface, and advance to a little west of the railway to Mansfield On the north, about Bobbers Mill, the Magnesian Limestone, which has run from Yorkshire, comes to a sudden termination. This is supposed to have been the southern end of an ancient inland sea, or lake, heavily charged with salts of lime and magnesian sulphate, or Epsom Salts. In and by the Leen valley is the Lower Mottled Sandstone, and the Bunter Pebble Beds, with recent river gravel and silt, and ancient river deposits of terrace gravel. In the lower part of Cobden Park, Mr. Shipman says there is a deposit of pounded gritstone from the coal measures of Derbyshire, and there are in the valley drift deposits of the Ice Age covering an ancient ravine. Coal. The seams of coal under Old Radford are full of interest. Among them may be noted the following (the information for which has been kindly supplied by Mr. W. Dawson):—At the depth of 108 feet there is a seam three feet in thickness; at 152 feet, 2 ft. 6 ins. ; at 251 feet, 2 ft. 10 in. ; at 264 feet, 1 ft. 10 in. ; at 364 feet, 2 ft.; at 395 feet, 2 ft.; at 783 feet, 3 ft.; at 824 feet, 3 ft. 10 in. ; etc., the last two, being Deep Soft and Deep Hard, are now being worked. Consider what all this indicates. Once-upon-a-time each of these depths was then the level of the surface of the earth at what we call Radford. Each of those seams of coal indicates a vast period of warm and moist atmosphere, in which grew wild, rank vegetation, which, pressed together, makes the thickness of each seam. Following each of those periods there were periods of wild confusion and convulsion, in which was deposited all the materials covering each seam, and following all this there was the age of intense cold called the Ice Age, and now, after countless ages, the sunlight that fell on the then growing plants is reproduced as electric light. Saxons. We have no means of ascertaining when men first appeared in Radford, or houses were first built and the land cultivated. We know nothing of British or Roman occupation. We know that it was customary with the Angles, or Anglo-Saxons, when they settled, to do so round a village centre, usually where the church then or afterwards stood, and to cultivate their lands in large fields, without hedges, in three parts of the parish, with the land divided into strips, and cultivated under communal regulations. There would probably be a small enclosure to each house, the serfs would dwell in huts, the meadows would be near the river, and for joint pasturage, and there would be a considerable amount of land sandy waste, some of it with wood, then underwood. There was probably a Saxon church, as, soon after the Conquest, Radford Church and its belongings were given to Lenton Priory, but of this church there is no earlier record. The Manor. Redeford was the name of the manor at the time of Domesday (1086), when it, with three carucates (?360 acres) of land had been taken from Alvric the Saxon, and given to William Peverel, lord of Nottingham Castle, who had on his manor farm eleven tenants, called villeins, who cultivated his farm, and four bordars, or cottagers, who were transferred with his land. He had also four mills, doubtless on the Leen, rendering three pounds, where he had the half of a fishery, and thirty acres of meadow, with three acres of underwood, worth four pounds. After eight hundred years have passed there are still four mills. Ulnod also held 1 bovate (?15 acres) of the King's servants' land. [£3 = to £90 now]. Sutton Passeys. There was till recently included in Radford boundaries what was once a village and parish church, called in 1086 Sutone, or Sutton Passeys, but the church is gone, and the site of the village cannot be traced. Alvric and Brun, the Saxons, had 12 bovates (? 60 acres) in manors here, and Ulsi had 11/2 carucates (?180 acres) assessed to the Danegeld, or land tax. It was subject to Ollavestone (Wollaton), and the land was waste. Certain lands at Sutton were given by Robert, son of Raph, to God and the church of the Holy Trinity at Lenton, and were there offered before God and all His saints upon the altar. Robert de Pesseys, for the health of the souls of himself and his wife Alice, gave to God certain lands here, and there were other like gifts. In 1816 the place answered for a whole ville, or parish, and in 1343 John de Colier, of Nottingham, gave land here to a chaplain to celebrate in the church of St. Mary at Sutton Passeys. Where was that church and village? It is supposed to be that part of Radford parish which was enclosed in Wollaton Park. Lenton Priory. William Peverel, the founder of Lenton Priory, bestowed the whole manor of Lenton (excepting four water mills), together with his demesne lands in Radford, upon the priory. That manor then, or afterwards, included the whole parish of Radford. To the prior's mill in the Marsh all the corn grown in Lenton and Radford must be taken to be ground. Certain lands in Radford given to the priory were described as of the villanage of Radeford, the holders being liable to do farm work on the farm of the lord of the manor without wages, in the place of rent for the land occupied. Thomas Ellingham, who was prior in 1422, had an eye to business, for he leased certain lands in the parish, the rent of which (two shillings per annum) was to be paid at the feasts of the Invention of the Cross and that of St. Martin, but every day the rent should happen to be unpaid after the time set, it was to be doubled. Let us hope the tenant paid promptly. Lenton Parish. The early history of Radford suffered probably by reason of the special importance attached to its sister parish Lenton, through the priory being there, for the early records contain scarcely anything of interest concerning it, but, like Jacob's wives, the Radford Leah can now boast of having many more children than the favoured Rachel. The two parishes have been largely joined together for weal or woe for a thousand years. The great meadow called Radford Marsh was the joint common ground for the pastures of the cattle belonging to the men of both parishes. It was low, and subject to flooding, but was of mutual convenience. The lands have also been intermixed, but are now divided, and further, the church livings have frequently been held by the same vicar. Under orders of the Local Government Board in 1880, 177 acres of land at Hyson Green, previously in Lenton parish, was transferred to Radford, lands in Radford were transferred to Lenton, and Ilkeston Road became the boundary line between the two parishes. Southwell. In accordance with the Pope's bull of 1171, the priest and churchwardens of Radford went to Southwell at Whitsuntide to join in the great procession, and took the parish Pentecostal offerings of 1s. ld.=27s. 1d. now. Borough Records. In 1301, arable land in the "Longebotham"—the Marsh—north of "the King's highway, called Derbigate," was sold. In 1301, 2 five roods of arable land in the fields of Nottingham, extending from the King's highway from Radeford towards Nottingham as far as Lingedale, was sold. Lingedale was Nottingham Forest. Richard Jeffson Nanneson was in 1385 hired by Roger Wilding, of Radfford, to take care of his sheep, but he very improperly went to Lenton Fair, and left the sheep uncared for, and they were for two days put into the pinfold, and so he, unfaithful shepherd, was sued for 40s. Very wisely he pleaded guilty, and the parties agreed. The jurors at the sessions presented that John Harre, of Radford, miller, did on Friday, June 22nd, 1453, play at dice, against the form of the statute (12 Rich. II. c. 6) by which act the games of tennis, football, quoits, dice, and the like were prohibited to serving men and labourers, they being enjoined to practise archery, instead of playing at these games. Gunpowder and guns were not in common use. Will history repeat itself, and instead of some youths spending their leisure time gazing at footballers in Bobbers Mill fields, will they be required to practise territorial drill and target firing, or, it may be that in order to gain a certificate of exemption, to learn thoroughly a trade by which to live ? In 1579 the Chamberlain of Nottingham paid 10s. for two hundred grosekydes—faggots of gorse "that wase gevyn to the colepytes (coalpits) at Radfourth." Inclosures. The Marsh was in 1768, with other open lands amounting to 1,223 acres, the subject of an Inclosure Award, under an Act of Parliament—see Mr. Godfrey's History, page 319. The forest and waste lands, about 300 acres, in the district now called Hyson Green, were enclosed in 1798, when 200 acres of it (being Thorneywood Chase lands) were valued at 5s. per acre per annum in its then state, and 20/- if enclosed, and ten acres were allotted to the Earl of Chesterfield for his right of chase, as Ranger of Thorneywood Chase.